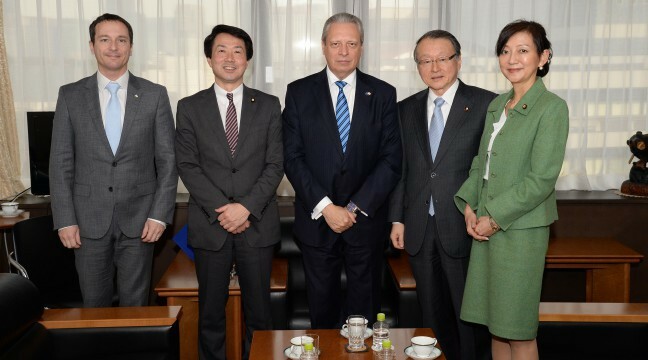 On January 31, Democratic Party President Kouhei Ohtsuka met with Viorel Isticioaia-Budura, Ambassador of the Delegation of the European Union to Japan, at party headquarters. At the start of the meeting, Ohtsuka expressed his appreciation for Budura’s visit and in return the Ambassador thanked him for agreeing to the meeting. Following this, Ohtsuka stated that Asia had much to learn from the way that the EU managed to deal so efficiently with the various issues that it faces. The two went on to discuss current events in Asia, the economic partnership agreement between Japan and the EU, on which a broad agreement was reached last year, this year’s Diet debate, Brexit and the situation with North Korea. Chair of Exploratory Committee, DP Headquarters for Party Reform of Strategy, Organization and Management, Masaharu Nakagawa, asked the Ambassador about post-war reconciliation in Europe, while DP National Rallying and Canvassing Department Director-General Hiroe Makiyama posed a question regarding the effect of the grand coalition on German politics.